Mobile, user friendly, customizable, comprehensive, intuitive…and did we mention secure? You won’t find a better way to connect with your students than eMedley. Accreditation standards making you lose sleep? No need. eCurriculum generates reports to quickly identify where, when, and how standards are covered in the curriculum as well as what is missing. eMedley provides Nursing Programs with a comprehensive and powerful set of student management tools to track experience and clinical competency along with program administration tools for affiliation management, approval processing, and advanced reporting. Use intelligent data reporting to answer the question, how do we effectively help our students achieve high pass rates on the NCLEX? With eMedley you can administer sample tests, review results, identify gaps and overlaps, and revise curriculum as needed to address disparities. Online teaching is a snap with eMedley. Our Learning Management System allows for secure access from anywhere at anytime. It’s never been easier to track attendance, create assignments, engage in group discussions, respond to emails and so much more. Mobile user friendly, customizable, comprehensive, intuitive…and did we mention secure, you won’t find a better way to connect with your students than eMedley. Need to suddenly track leadership development, teamwork, informatics, and cross collaboration as soon as possible? eMedley can help you keep up with rapidly changing expectations. Even after initial implementation is complete, updates can be made, new modules can be added and as always customer support is there to assist with transitions. Students need a comprehensive portfolio to showcase their education and experience. eMedley’s portfolio builder helps them to easily create an attractive and robust web-based portfolio. Clinical scheduling just became a breeze. Review the information comprehensively on our One-Screen-Scheduler, change what you need, leave the rest and publish it all in a snap. Let the system do the tracking for CCNE, Essential Skills, NCLEX, NONPF Competencies, and Program Objectives. eMedley can provide you with a clear visualization of mapped curriculum for data driven decision making. Preceptor evaluations, student evaluations, faculty evaluations,etc. You create the content, we create the forms and evaluations just got a lot simpler. Get a broader understanding of the ‘big picture’ to help ensure students are getting the right amount and quality of clinical experience. Let the system tell you when evaluations are due, immunizations expire, preceptor licenses expire, affiliations need updated, and data uploads are complete. eMedley modules can be customized to include university specific goals, learning objectives and data requirements to meet your unique and specific needs. eMedley cuts out the middleman by allowing the clinical site to enter its own capacity and access documentation for students scheduled at the site. Ensure that students are getting the right amount of clinical experience and time at each site. Built in approval and review processes for assignments, time logs, case logs, evaluations, and assessments. So long paper cuts, store and manage all documents in a secure online system accessible on the cloud at any time and any location. Diagnoses, procedures, CCNE Essential Skills, ACEN Standards, NCLEX Blueprints, and custom program standards and objectives preloaded in. Create exams with effective questions and content mapping in mere minutes. examN provides a secure and easy to use environment for creating, scheduling, administering and grading exams. Map where, when and how students are learning required competencies. A comprehensive learning management system tracks attendance, manages assignments, announcements, and more. Online evaluations of students, faculty and preceptors makes assessments simple. Automatically schedule clinical sites with One-Screen-Scheduling. Log SOAP notes, ICD-10 and CPT codes quickly on eMedley’s mobile friendly interface. User-friendly dashboards provide comprehensive results of evaluations to assist in constructive feedback. eMedley supports the unique needs for BSN programs to track curriculum, clinical schedules, rotations, skills, and performance. Students can be assigned directly to their faculty preceptor to streamline the tracking process. 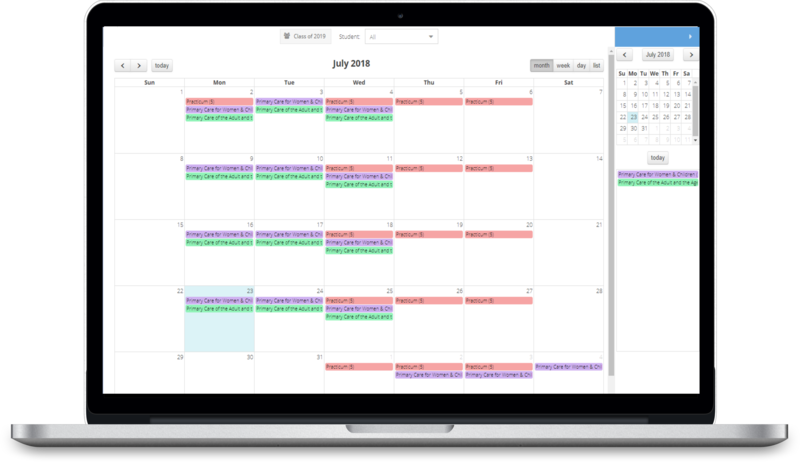 Scheduling can be done for an entire group of students in one shot and daily schedules can be managed and published for each student. eMedley also includes many assessment and performance based evaluation reporting tools to ensure students are mastering essential skills and core competencies. eMedley supports multiple automated and manual scheduling options for medical programs, including rotation, simulation, and Community Health scheduling, organized by day, week, or block. Perform weekly clinical skill evaluations and skill-specific evaluations (Performing Venipuncture, Removing a Feeding Tube, etc.) throughout the clinical experience to measure student performance and mastery of key skills. Individual schedule reports are available for students, making it a breeze for them to check dates, site and preceptor assignments, etc. Comprehensive and high quality clinical experience is key for graduate nursing students. Students can see thousands of cases and require easy and mobile case logging. eMedley simplifies the clinical tracking process for both students and administrators. The system includes comprehensive reporting to track where in the curriculum competencies and essential skills are covered and then ties in how students are performing out in the field. 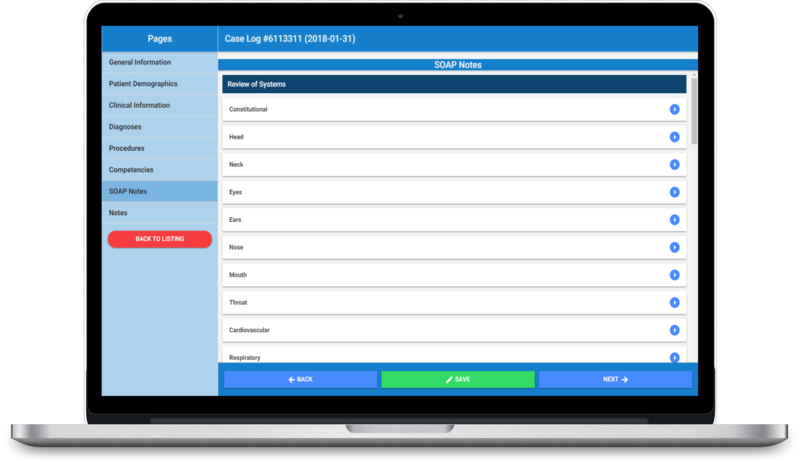 Comprehensive, program-specific logging of patient cases, with built in experience-tracking the option to use the SOAP note style. Students can customize, integrate, and publish showcased experiences within eMedley’s intuitive portfolio site builder. Students have the ability to request specific preceptors from their various specialties: Adult, pediatric, primary or acute care, nurse anesthesia, etc.